Bio: Jake grew up in Port Washington, New York. 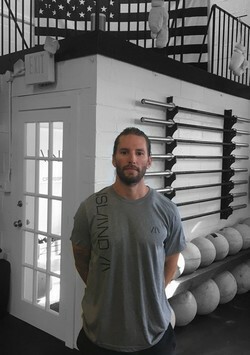 He developed a passion for functional fitness after returning home from college in Boulder, Colorado. He became a personal trainer in 2009 and found CrossFit later that year. He began to experiment with the workouts and realized the powerful results that the program was capable of. He earned his CrossFit Level 1 credential in 2010, and has coached in several CrossFit affiliates and strength and conditioning gyms since. He has earned numerous credentials in the field and graduated with distinction from Hofstra University with a master’s degree in Sport Science. He also attended the graduate program at Hofstra for Physical Education. After spending years developing his own philosophy, Jake founded Island Athletics in 2017 to spread the IA lifestyle and positively influence the community that he grew up in. He aims to provide a positive place for people to meet, learn, perform, and grow.